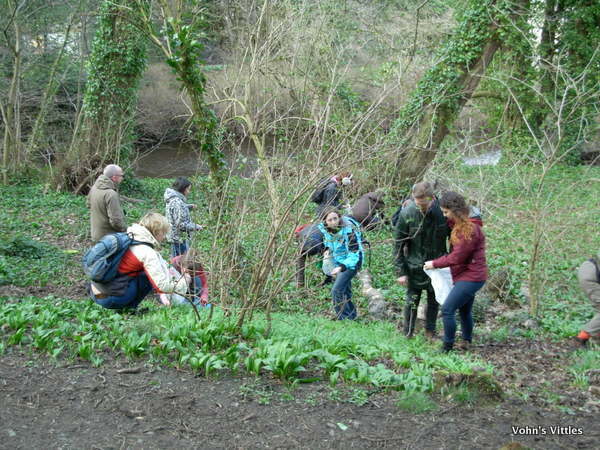 A couple of weekends ago Mr Vohn and I were invited to a Sunday foraging workshop that I simply have to tell you about. Do you remember the masterclass I went to on Valentine’s Cooking? That class was lead by the head chef at Edinburgh Larder Bistro and it turns out that Edinburgh Larder run their own events too, not only in their restaurant and cafe but also out and about around Edinburgh. Spring is the most amazing time of year for new leaves shooting and it signals the coming of the warmer months with their bounty of exciting ingredients. 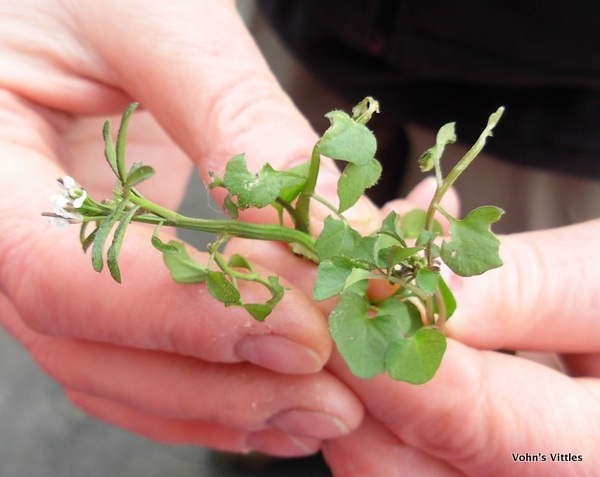 This course is a great introduction to the wild foods available in the city. 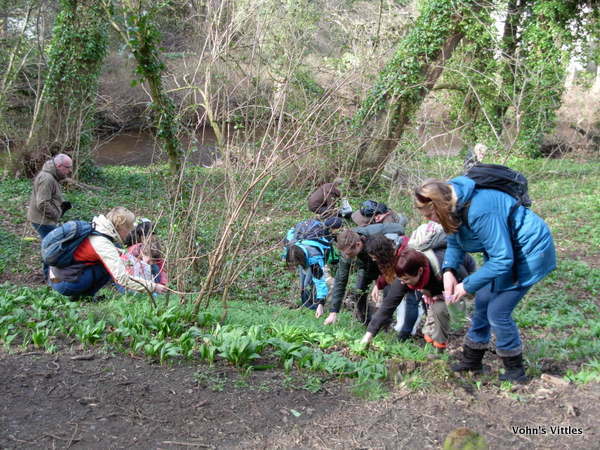 Starting at the Water of Leith Visitor Centre, we’ll wander along the canal finding some delicious foraged herbs and stopping for a tasty picnic along the way! When Eleanor Cunningham, the owner of Edinburgh Larder, invited us along I jumped at the chance. Eleanor was there to meet and greet us but unfortunately couldn’t join us on the walk – the busy life of a restaurant owner! She kindly left us lots of tasty goodies to have later for lunch – all freshly prepared that very morning at the Edinburgh Larder Cafe. 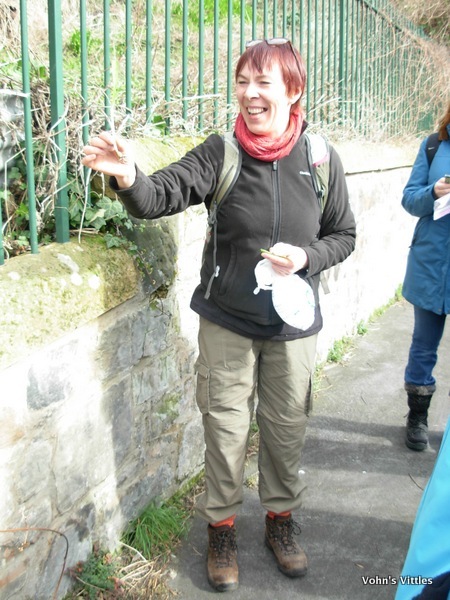 So, the walk was led by Anna Channing, a medical herbalist who delights in the wild foods available in the city and who has amazing depth of knowledge of their health benefits. Here’s lovely Anna! Anna explains that the plants we shall be looking at today are all great tonics, which means that they tone the body from the inside. This sort of cleansing is much gentler and healthier for the body than rigorous detoxes, which can strip the body of vital nutrients. Tonics are often gently stimulating, diuretic or laxative – good for helping kidney function & great for aiding digestion. 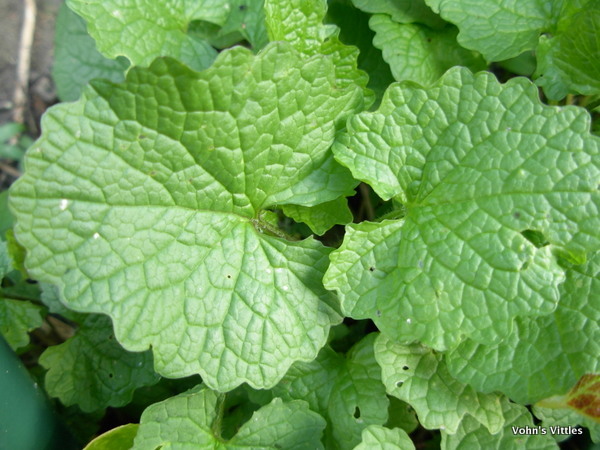 Garlic mustard is part of the cabbage family (Brassicaceae) and, as such, all parts of it are edible including the flowers. The young leaves, shown here, are heart-shaped whilst mature leaves are more pointed at the tip. It smells of garlic when bruised and its garlicky taste is great in mashed potatoes or tattie salad. 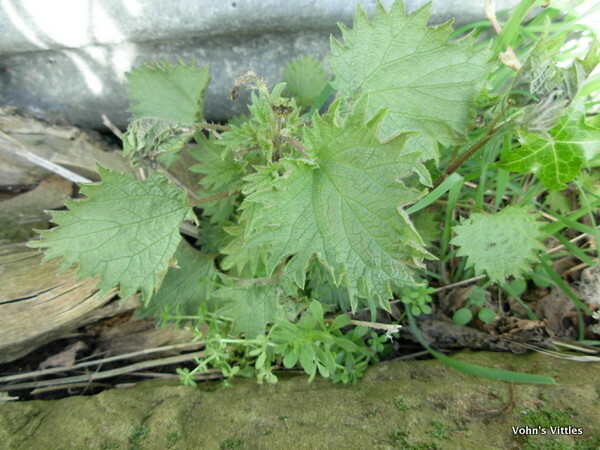 Nettle has many health benefits, especially as a diuretic and to reduce inflammation in arthritis. Most commonly it is made into tea or soup. Nettle fibres are hollow, so can be woven to create naturally-insulating fabrics due to the air trapped inside the fibres. In days-gone-by the leaves and stems were used to make a green dye, whilst the roots were used to make a yellow dye. 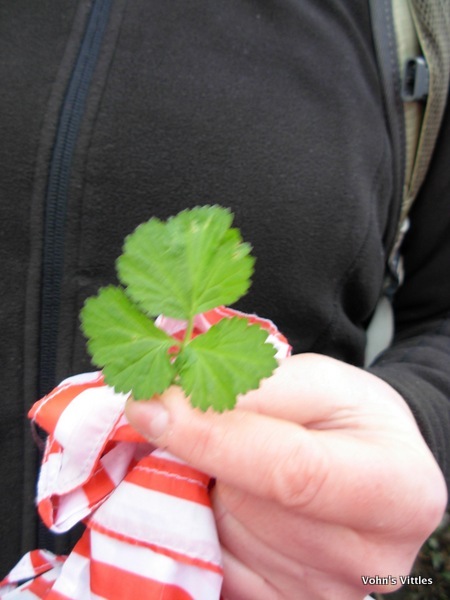 Nettle leaves have stinging hairs and Anna shows us how to pick it without getting stung – the trick is to grasp it firmly but none of us is brave enough to try! Anna also shows us the method of rolling it up to eat it raw without getting stung, which I have seen demo’d once before by an experienced botanist – I don’t think any amount of experience will induce me to risk it! Anna recommends carrying a plastic bag to use as a make-shift glove if picking a lot or, in my case, any! 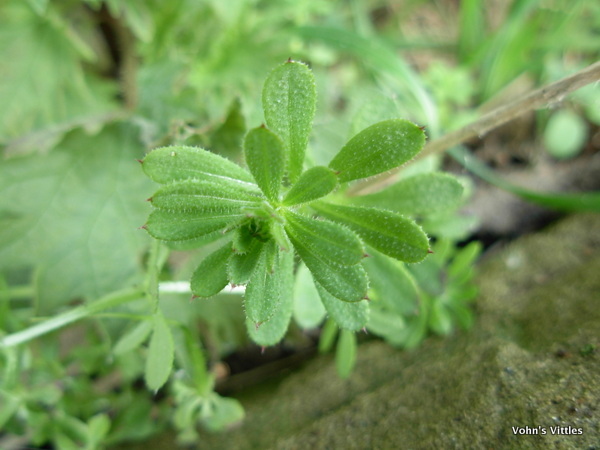 Sticky Willy as it’s known in Scotland, or Cleavers as it’s known in England, is actually not very sticky when young, so spring is the best time to eat it. It is a great detox or cleansing tonic due to its gentle laxative qualities. Anna recommends steeping it for 15 minutes to get the best of its nutrients, then drinking as a nice light tea. Alternatively it can be torn into salads or blitzed in smoothies. It can also be used as a dye, generating an orangey-pink colour. Comfrey is the first plant we look at which can easily be confused with something else, something toxic! 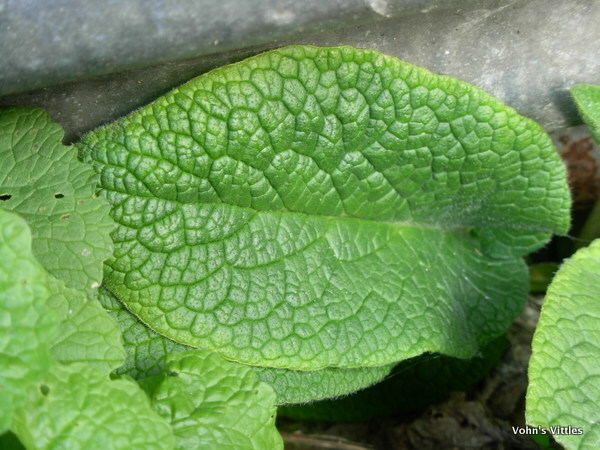 Comfrey leaves are quite stiff and coarsely hairy. Its toxic look-alike is Foxglove, Digitalis purpurea, which has floppy leaves, silky to the touch. Anna explains how important it is to know exactly which plant you have and advises using a good plant ID book. She also encourages us to use botanical names, which are unique and exact, as opposed to common names which vary widely across regions/countries. I am delighted to find that comfrey tastes like cucumber, which I adore but cannot eat as it gives me hiccups – I can now get my cucumber fix by growing or foraging comfrey! I am very excited by Anna’s suggestion of dipping the leaves in a light batter and frying as fritters. 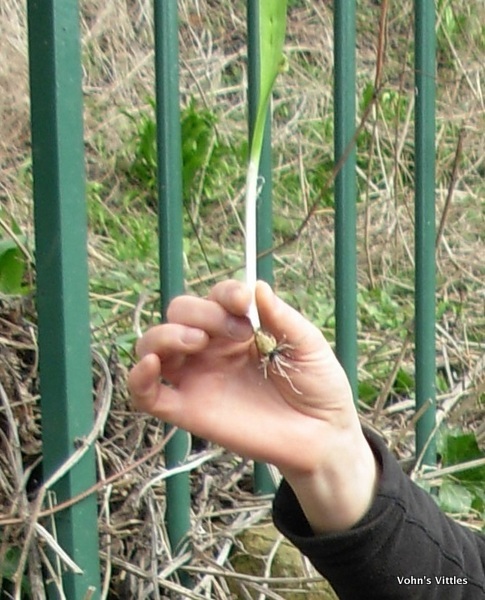 Few-flowered leek is often confused for wild garlic but it has a much narrower leaf and a triangular stem. It does indeed smell of garlic but tastes more like a garlicky spring onion. Amazingly we have already learnt so much but haven’t yet even left that bank at the visitor centre! Now that the last few late-comers have arrived, it is finally time to head off into the woods along the canal. We delve into Craiglockhart Dell. A “dell” in Scots is a steep-sided valley cut through by a river, in this case the Water of Leith. The “risk” is your own and can be minimised by accurate plant ID and common-sense. If you have any concerns about contamination, plants can be washed in water with a little vinegar added or in Milton fluid, as long as they are thoroughly rinsed. Anna points out that most pre-prepped supermarket salads have been washed in chemicals and who knows if they are rinsed thoroughly enough afterwards! The “rights” are about whether you have the legal right to forage. Luckily in Scotland we have wide-ranging access rights and can collect plants from pretty much anywhere, as long as we avoid private houses and gardens. The “responsibility” is about being responsible for your actions and also about caring for the environment. In terms of foraging this means only collecting enough for your own personal use, not harvesting everything in sight, and only collecting the above-ground parts of a plant, never up-rooting them. Full details on this can be found in the Scottish Outdoor Action Code. So, now we know the rules, our woodland foraging can begin and our next plant can be smelt all around us! 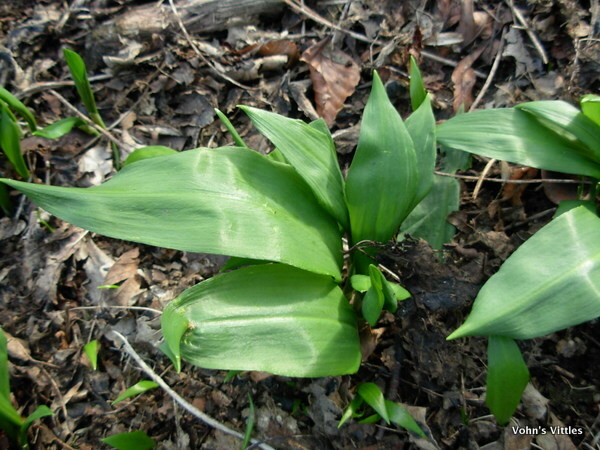 Wild garlic has a shiny, floppy leaf with a prominent mid-vein on the back. It can be used in many different dishes and features prominently in our lunch later. 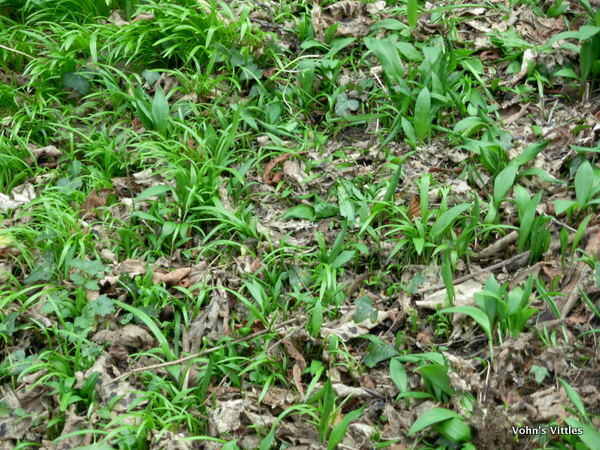 Wild garlic is also an Ancient Woodland Indicator and indeed, the information board at the start of the walkway stated that this area has been continuously wooded since the last ice age. A remnant of Scotland’s ancient woodland right in the heart of the capital! 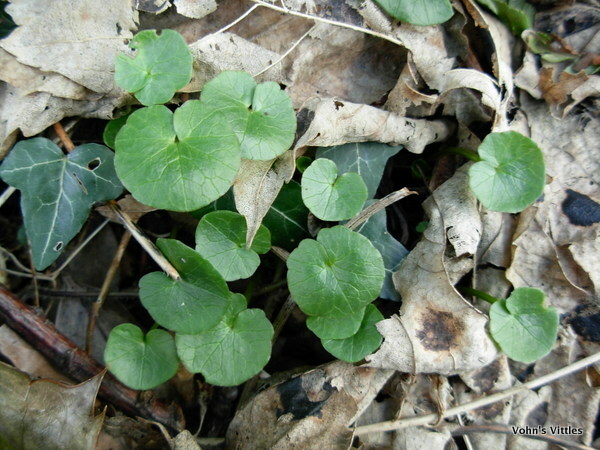 It is only the young leaves of Lesser Celandine which are safe to eat. They are rich in Vitamin C. The older leaves must be blanched first in boiling water, whilst the flowers are not edible. Anna reminds us that many modern medicines are synthetic copies of the active ingredients in plant extracts. It has often been found that the side-effects of a particular drug can be balanced by another chemical found in the same plant. This is the benefit of herbal medicine, since eating the whole plant provides this natural balance and the effect is also gentler on the body and with fewer side-effects. 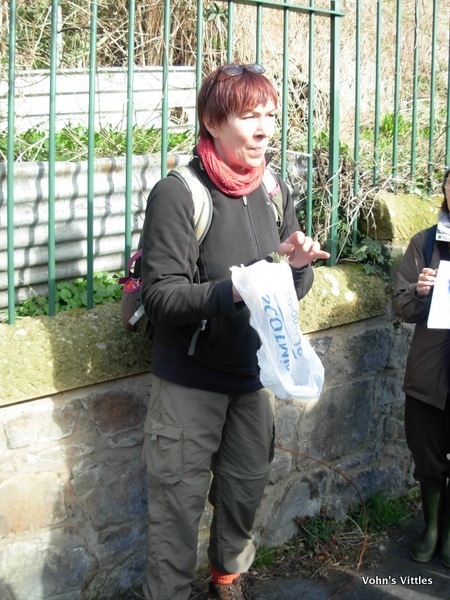 We now find a hillside rich with wild garlic and few-flowered leek and Anna lets us loose with our foraging bags! Sorry the picture is fuzzy! I was getting tired. I know this plant for its upright yellow flowers in summer but didn’t know that its leaves and roots are edible. A tea made from the leaves is used as an astringent to tone the gut and is very helpful to calm the digestive system, especially when suffering from diarrhoea. The roots were traditionally used as a clove-flavour, when cloves were an exotic expensive spice unaffordable to many. It is now time to head back for lunch and I am sad that we didn’t spend more time in the woods by the canal. Mind you it is an “urban” forage and not many cities are as blessed as Edinburgh with its ancient green spaces. We gather up the lunch items provided by Edinburgh Larder Cafe and take them outside where, growing there on the bench, Anna delights to discover another plant to show us! I know this plant well – it arrived in my garden a few years ago when a friend gave me a plant from her garden and this little blighter hitchhiked in with it. It is easy enough to weed, as it has very shallow roots but is impossible to get rid off and lots of gardeners call it a noxious weed! I’d never even though of eating it, even though it is called “cress”. It is not bitter at all and is quite like a peppery mustard cress. I resolve to eat it as I weed my garden now! So, to lunch and Edinburgh Larder Cafe have really spoiled us with the great selection Eleanor left for us! 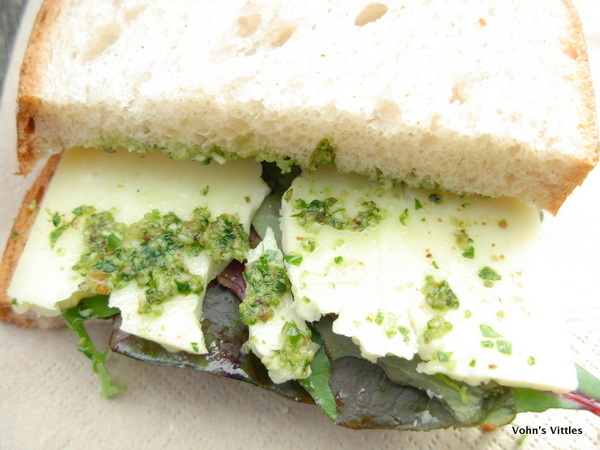 We have lovely thick cheese & salad sandwiches with wild garlic pesto. The pesto is pungent with strong garlic and gives a great kick and contrast to the mature cheddar cheese. 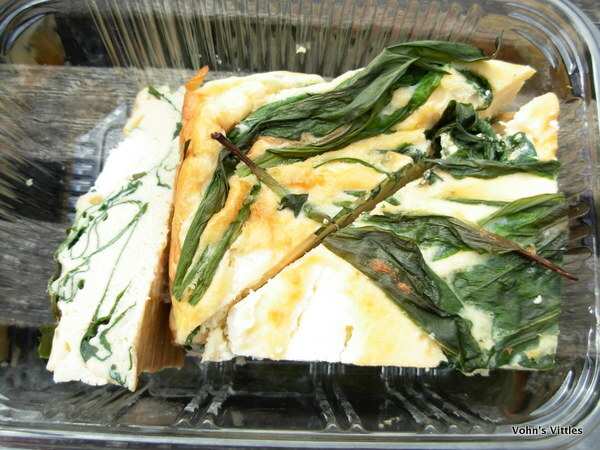 Frittata with wilted wild garlic, which has a much more subtle mellow garlic flavour as the garlic leaves have been cooked. 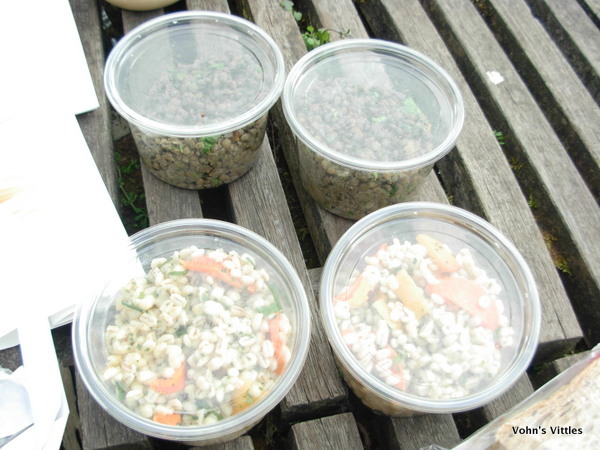 Puy lentil salad and a barley salad which is fresh and fruity. Anna has brought some goodies too. The jar below is her homemade dip made from cannellini beans, blitzed with the zest and juice of ½ a lemon and seasoned with salt and pepper. She then chopped up the garlic leaves pictured in the bowl there and mixed them in, passing round breadsticks for us to use for dipping. It is delicious – zingy with lemon and pungent with garlic without being at all overpowering – a truly lovely way to use our freshly-foraged wild garlic. Edinburgh Larder Cafe also provided sweet treats! I had the chocolate hazelnut brownie, which was luscious and moist with chunks of hazelnuts giving a gorgeous crunch. Sorry – no pictures of the brownies – too busy enjoying! I overheard a couple of girls in the group discussing how they were up there with the title of World’s Best Brownie – I have to agree with them! 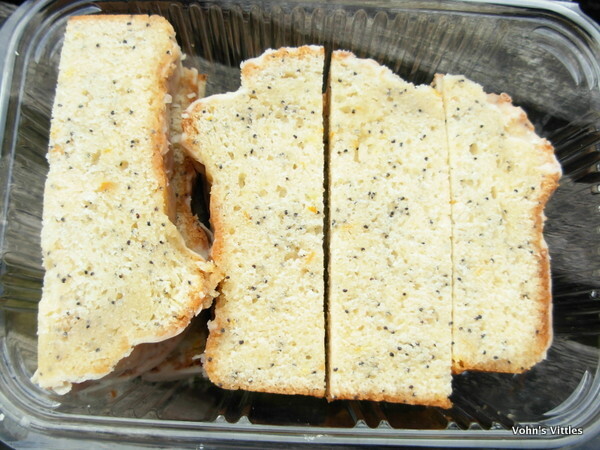 Mr Vohn went for the lemon and poppy seed cake, which he said had a nice texture and the icing in particular had a great lemony zing. Anna finished off by showing us the book she would recommend – Cooking Weeds by Vivien Weise . One of the most amazing things to discover in this book are the nutritional tables showing how many more vitamins and minerals weeds have compared to similar garden vegetables. It was a wonderful workshop with Anna Channing. If you’d like to know more about Anna’s work with people, plants and places, check out her Floramedica website. It is full of great information including recipes using herbs and wild food; factsheets on making home remedies to treat common ailments; future events, courses, workshops; and you can even buy herbs, tinctures and assorted sundries safe in the knowledge that they are top-quality and suitable for making your own creams and balms. Thank you so much to Edinburgh Larder Cafe for arranging the workshop with Anna and for the fabulous food they provided for lunch. Thanks especially to owner Eleanor Cunningham, who invited us along to such an enjoyable event. If you’d like to taste those world-class brownies for yourself (other goodies are available), check out the Edinburgh Larder Cafe. Their summer foraging event with Anna is in June and will be all about edible summer flowers and leaves – I’d highly recommend it – but do get your skates on as it sells out fast! Vohn and Mr Vohn attended the urban foraging workshop as guests of Edinburgh Larder.